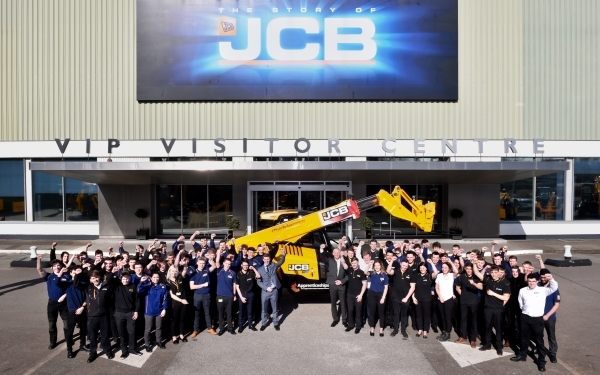 A JCB Loadall telescopic handler built entirely by the company’s 68 apprentices is going on show to celebrate national training opportunities for young people. 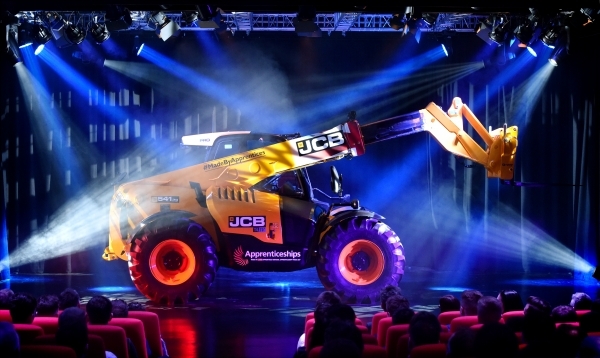 The stylish machine was unveiled in the visitor centre at the JCB World HQ during National Apprenticeship Week. Learners from JCB sites across the country have played their part in building the iconic Loadall, a machine which celebrates its 40th anniversary this year and which revolutionised the lifting and placing of loads on farms and construction sites when it was introduced. Over 200,000 Loadalls have been sold since its launch in 1977, but none as unique as this one, which will eventually be auctioned off for charity. Co-ordinated by JCB Training, apprentices from the World HQ in Rocester, Staffs, and as far afield as JCB Transmissions in Wrexham and JCB Power Systems in Derbyshire all played their part. JCB Transmissions manufactured the axles and gearbox; JCB Power Systems manufactured and built the engine; the Hydraulics Business Unit (HBU) built the lift, extension, tilt and displacement rams; JCB Cab Systems in Rugeley supplied the cab and JCB Marketing came up with the colour scheme and promoted the initiative at various events. All parts were assembled at the JCB World HQ to build the Loadall Agri Pro machine. Chris Morris, of JCB Training, led the project and said it was a great way to promote the company’s commitment during the National Apprenticeship Week. Sue Husband, Director of the National Apprenticeship Service said: “A remarkable amount of skill and dedication has gone into this project over the past six months and all the apprentices involved should feel immensely proud. They have shown what it is possible to achieve through an apprenticeship and it’s great that they have been able to take part in this project to help celebrate the 40th year of the Loadall Division. Apprentices who took part in the project, from across JCB’s factories, all spoke of the development of skills and boost to confidence building the Loadall had given them.